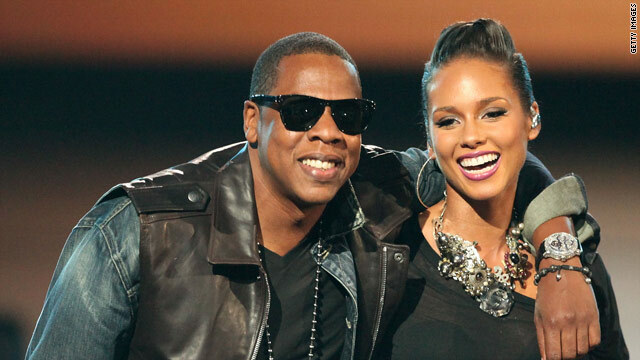 Jay-Z and Alicia Keys' "Empire State of Mind" remains in the top 10 of the Billboard charts. (CNN) -- Whatever your state of mind or current location, there is probably a remix of the Jay-Z/Alicia Keys ode to New York City "Empire State of Mind" available for your listening pleasure and localized for your hometown. Simply type in the keywords "empire" and "state of mind," paired with the name of your city, into Google or the search function on YouTube to see if some enterprising rapper and mezzo-soprano have tailored the blockbuster single to your city, town or borough. Whether the surge in remixes is from people trying to refute the notion that New York City is the center of the universe, or because the song is a prototypical anthemic beat that every city wants to claim as its own, it doesn't seem to matter. Nearly 100 city-specific remixes have already popped up around the Internet. "It had been a while since a song filled New Yorkers with as much pride as this one does," said M. Tye Comer, the executive editor of Billboard.com. "I think people from other cities are seeing this, and there is an envy of that. They want to take a piece of that and bring it to their city." Versions of the song catering to Philadelphia, Pennsylvania; Cleveland, Ohio; Pittsburgh, Pennsylvania; San Diego, California; Toronto, Ontario, in Canada; Minnesota; Louisville, Kentucky; Miami, Florida; Chicago, Illinois; and Boston, Massachusetts, are posted, with more being added frequently. There is even an ode to the 6,000-person farm town of New Holland in Lancaster County, Pennsylvania. "I thought it would be really cool to make a song about my hometown, which is the exact opposite of New York City," said college student Matthew Besson, who wrote "New Holland State of Mind." "There are still Amish driving around in their horse-drawn carriages. And unlike New York, there is nothing to do in New Holland," he said. Besson also wrote the song to celebrate his town and show that there isn't anything wrong with living in small towns like his. "I was just inspired by my hometown, and I wanted to give the small town of New Holland its own anthem," Besson said. While Besson's anthem came from a place of love, other remixes came from a place of rivalry, as is the case with various odes to the city of Boston, created because denizens of the rival sports city couldn't enjoy a song that praised the Empire State. "I was riding down the streets of Boston one day, and I was singing the hook to 'Empire State of Mind' in my car. This guy gave me a look as if he was saying 'Wait a minute, you are in Boston!' Right then and there, I decided that I was going to do a remix that represented Boston," said computer instructor Dychell Reeves, 39, creator of "Beantown State of Mind." The lyrics of Reeves' version, one of many created for Boston, include, "Welcome to Boston, the city you get lost in/Home of the Celtics, clam chowder, shellfish." Praising a city's sports teams is an integral part any the "Empire State"-inspired anthem, as is evidenced in "Louisville State of Mind," created by amateur rapper Cecil "Kasanova" Kirby, 25. "Yeah ... Louisville, where we love them Cardinals. ... Home of Muhammad, Ali who was known for having them quick hands," Kirby raps in his remix. The song has been viewed nearly 10,000 times on YouTube and has been played in clubs in the Louisville area. "Empire State of Mind" debuted over the summer and spent four weeks atop the Billboard Hot 100 List. The song remains in the top 10. It was originally penned by Brooklyn, New York, natives Angela Hunte and Jane't "Jnay" Sewell-Ulepic during a spell of homesickness while traveling in London, England. They wrote the track as a way to express their hometown longing and sent it to Roc Nation, the music publishing and entertainment company owned by Jay-Z (whose real name is Shawn Carter). Jay-Z, who is also from Brooklyn, recorded the song with fellow New Yorker Keys, and the single was released in October. The song became an anthem for the New York Yankees during their championship run this year. Shortstop Derek Jeter used the theme as his entrance music, and it was performed live by Jay-Z and Keys before the second game of the World Series. Earlier this month, comedian Stephen Colbert of "The Colbert Report" recorded his own version of the song with Keys. Three 17-year-old high school juniors from Minnesota are receiving some local fame with their version of the song. Matt Aalbers, Jack Ashcroft and Jordan Neu were just fooling around when they created the satiric "Minnesota State of Mind," with lyrics like: "We border Canada, for that I am proud/East of the Dakotas, don't hate the north state/Thank us for Scotch tape, home of ten thousand lakes." "Every day, we get someone new coming up to us saying 'great video,' and we discover it on many review blogs and local radio station Web sites. We never thought it would take off like this," Ashcroft said. But not all New Yorkers are pleased with their beloved anthem being hijacked by the rest of the country. "It is beyond ridiculous," said New York Post music reporter Ryan Brockington, who blogs on the tabloid newspaper's PopWrap.com site. "It makes me think of other cities ripping off the 'I Heart NY' T-shirt. It's just sad."